Have you ever dropped something sharp on your foot, or stepped on something pointed? It hurts to damage your feet like that—especially if the object that harmed you pierced the skin. What about when your own body is the object that pokes and punctures the surface of the skin? It does happen, and more often than you may think. Nail tissue is hard and grows slowly, but if something happens to damage it, it can curve or change and become ingrown. Your nails are supposed to grow straight outward from the nail bed to protect the ends of your toes. Sometimes, however, they curve or grow sideways and into your skin. Though this can happen naturally because of unusually curled nails or a congenital problem, usually it’s the result of an injury or poor trimming habits. Stubbing or otherwise hurting your toe damages your nails. Too-tight shoes cramp the toes and put pressure on the ends, curving the keratin tissue. Toenails that have rounded edges instead of straight ends, or are trimmed too short, may curve or grow more sideways as well. As it grows, it pinches or pierces the skin, causing irritation and inflammation. If left alone, the wound can even become infected. 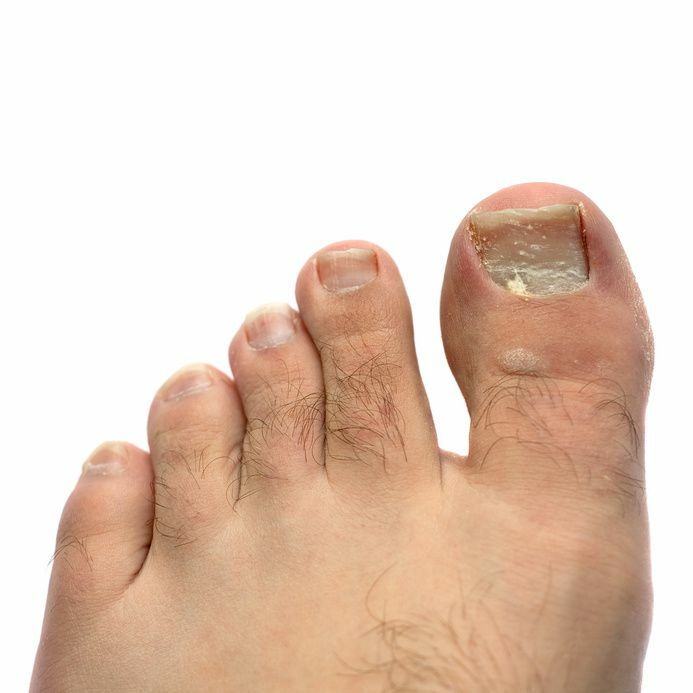 This uncomfortable condition leaves your toe red and swollen. Sometimes pus or clear fluid even drains out of the area—especially if it gets infected. Ingrown nails have a tendency to recur if they aren’t treated properly. The nail edge that is damaging the skin needs to be removed so the rest of the nail can grow back properly. Dr. Joel W. Brook, Dr. David R. Northcutt, Dr. Irene Arroyo and Dr. John Baca will evaluate the affected toe to determine the best way to repair the injury. If the condition isn’t too serious, the doctors may try to lift the nail and place cotton or gauze under it so that the nail is encouraged to grow straighter instead of curved. If the problem has progressed too far, however, you may need to have the nail partially or completely removed. For a partial removal, your toe will be numbed. The portion of the nail tissue that is digging into the skin will be cut away and allowed to regrow straight. If the problem recurs, the nail root may be destroyed to prevent it from growing incorrectly again. For more serious ingrown nails, the whole nail may need to be excised. Any infection will need to be cleaned out and treated with antibiotics. This is especially important for patients who struggle with weakened immune systems, like diabetics, since even small infections can lead to serious complications. As you heal, you’ll need to be careful not to damage the unprotected end of your toe, but you should be able to return to your activities within a few weeks. If you’re struggling with nails that pinch and poke and curl into your skin, you don’t have to suffer through it. Ingrown nails can be treated quite easily by the experts at Dallas Podiatry Works. Rather than wincing every time you have to wear shoes or walk around, restore your toes to health. Contact Dallas Podiatry Works for an appointment or more information by calling either of our two offices—for the Dallas office, call (972) 566-7474; or for the Plano location, call (972) 943-3323—or by visiting our website contact page.